From the middle of the week I could see that today was shaping up to be a busy day. 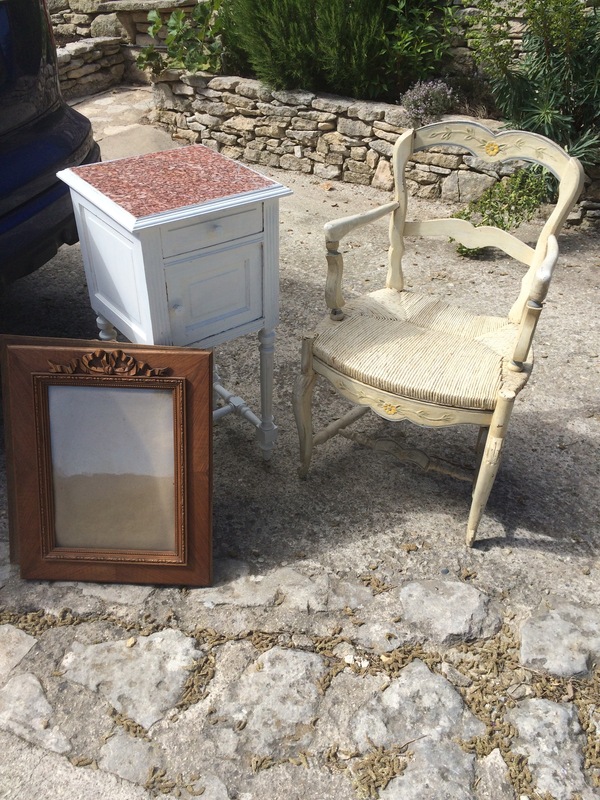 Not that I had a list of things that had to be done, but more because I’d seen signs for 3 local ‘Vide Grenier’ events and I fancied popping over to the Brocante market at Carpentras too. 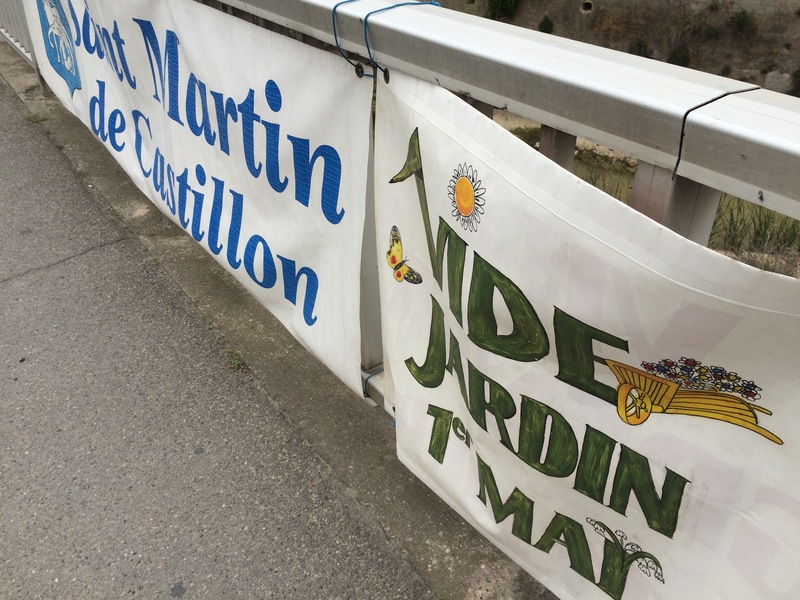 There were also tempting signs for a ‘Vide Jardin’ at nearby Saint Martin De Castillon and another plant & craft sale at Oppede. So much to do & only one day to do it all!The thing we need more than anything is furniture (there’s only so many times you can move 1 chair around the house before the novelty wears off!) & there’s nothing we like more than buying pieces from different places, doing a bit of work on them if necessary & fitting them into our home. The thought of being able to buy a few local pieces to work on was far too tempting. So that was it, my day was planned out & relatively early I headed for the first one, hosted by the Fire Service in Apt. I thought I was early, but clearly not, as the cars were already parked at the side of the road some distance away, so I abandoned mine along with the others & walked in. Even though it was really chilly there were a good number of stalls, but nothing leapt out at me, so after a relatively brief visit I headed on to the next at Gargas. This one, run by the local Lions Club was slightly smaller, but there were more stalls with bits of furniture and other odd bits to take my fancy than there had been at Apt. Within a few minutes I’d found a lovely pair of old wooden picture frames, which I found out had previously held photos of the seller’s grandparents. Now I know I can’t sit on a photo frame, but they were so nice that having dragged myself away from them once I found myself back at the stall & carrying them away for 12€. All I need to do now is tidy them up a bit & find suitable pictures to go in them, hopefully having them ready for my hubby To hang when he takes over the reins here in a couple of weeks. 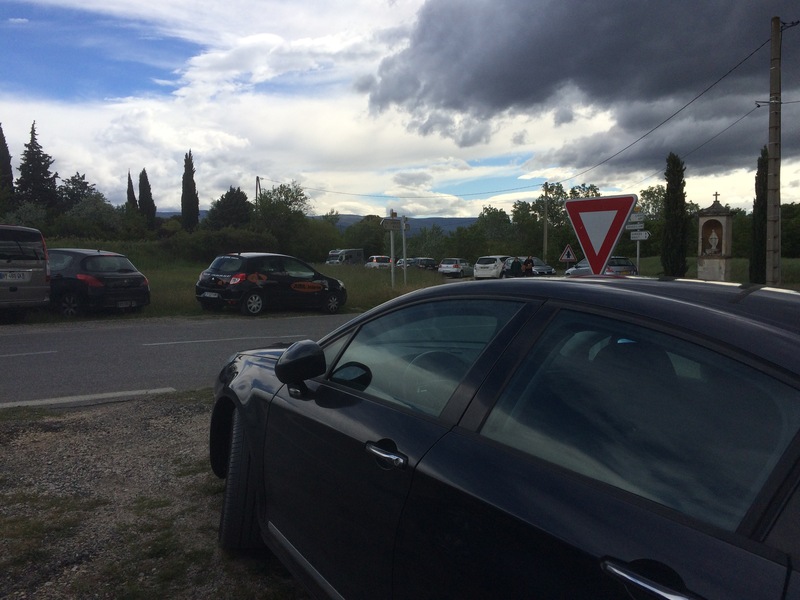 From there I headed to Joucas for another event, this time organised by the local Mairie. By the time I arrived (shortly after 10) the nearest parking was a considerable distance away, so again I abandoned the car & headed in. 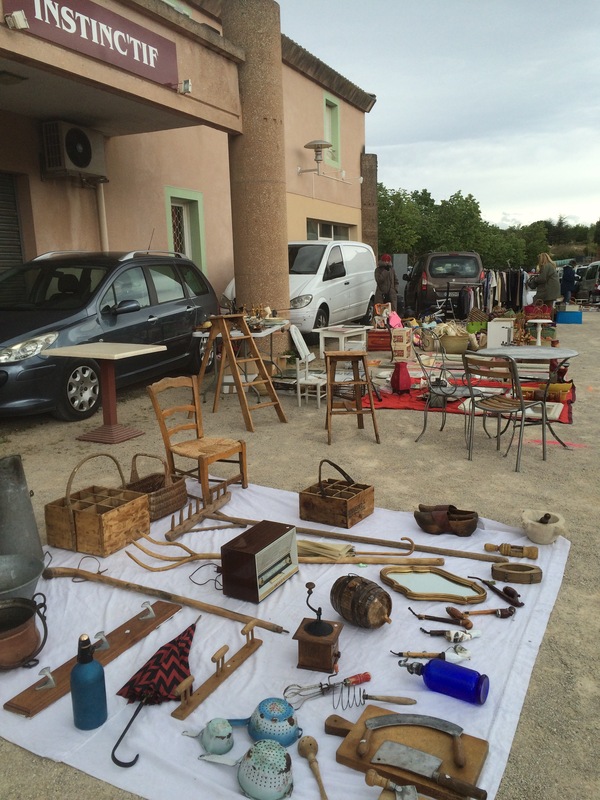 The Main Street through the village had been barricaded off & this turned out to be much more of a Brocante Fair than a traditional ‘Vide Grenier’, which are more akin to car-boot sales than anything else. 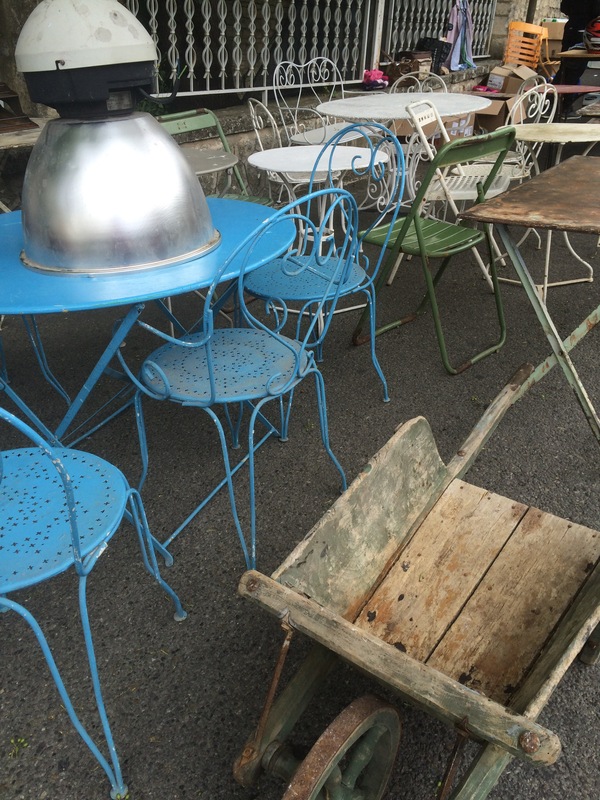 After a fortifying coffee at the local café I set about looking at the stalls, quickly buying a pretty old bedside table and it was only then that I remembered I would have to carry anything I bought nearly 1/4 mile back to the car. With this in mind I passed by the heavy wooden mirror & chest that would have looked great in the front room, but couldn’t resist a wonderful old rush seated chair, in need of a new coat of paint. With my sensible head now on – I did two trips back to the car & then pottered on, through the ‘Foret de Venasque’ to Carpentras. 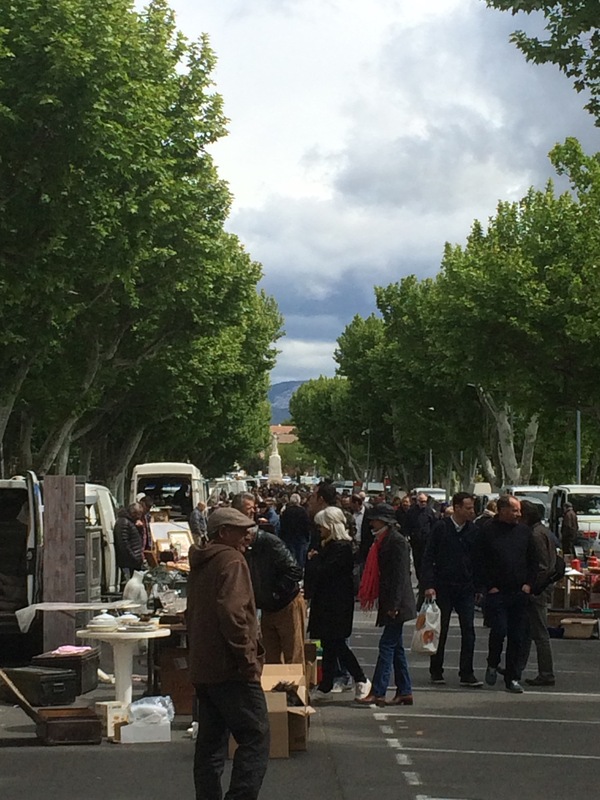 I’ve heard great things about the Sunday Brocante market at Carpentras, which I’d been told had a good range of stalls & much better prices than the nearby one at L’Isle Sur La Sorgue. 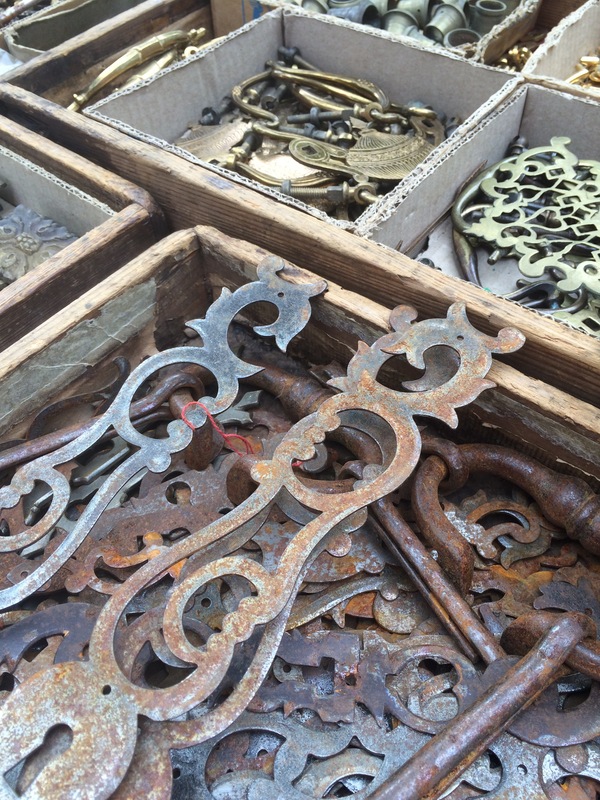 I wasn’t disappointed and although it was clear that some traders hadn’t arrived due to the weather, there was lots go look at, ranging from industrial pieces to ornate chests. Again I would have had to carry anything I bought quite a distance back to the car, so just enjoyed seeing what was available & saving buying for another day. 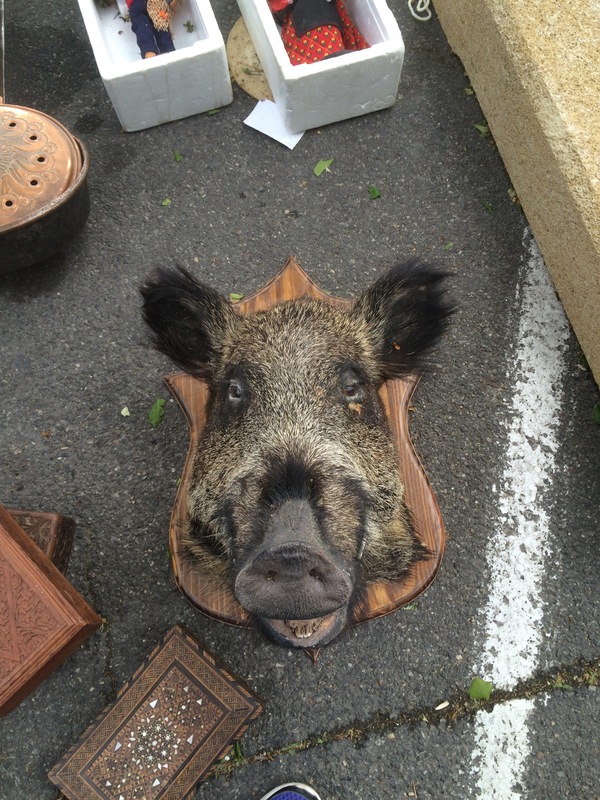 I decided against buying the mounted Sanglier head, as I didn’t think it would really fit with the look I want in the house – however having just spoken to my hubby he’s gutted! Apparently it was just what he wanted – perhaps I’ll need to keep him away from our buying trips when he’s out here?? On the way home I noticed signs for a plant & craft sale in Oppede, so popped in as I’m hardly pressed for time at the moment. 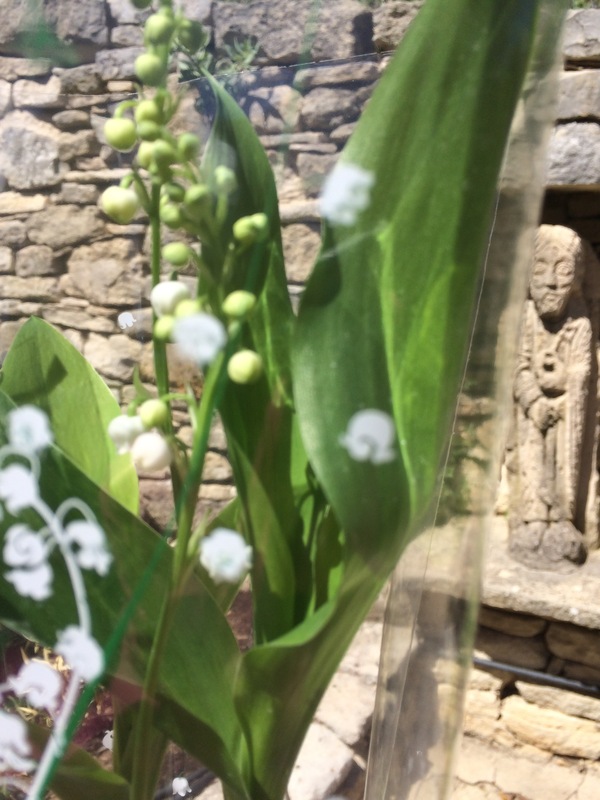 All day I’d seen stands selling Muget (lily of the valley) and here was no exception. It’s tradition to give the flower to friends & family on May Day, so I bought a pot from the local school’s stall to give to our lovely new neighbour, who has been so helpful since we moved in. I’m happy to say she was delighted with the gift & the afternoon ended happily chatting with her over a cup of tea, eating Madeleines. So all in all a busy, but enjoyable day. I now have some work to do on the pieces I bought, but that’s half the fun. 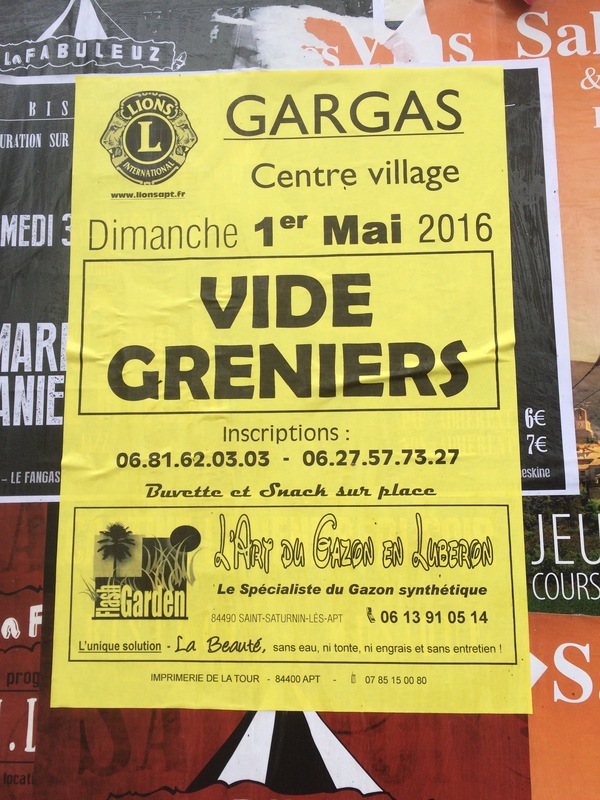 I must keep an eye out for more Vide Greniers & Brocantes, but perhaps next time I’ll try to park a bit closer! Next Post A market, a Citadelle & difficulties with what to wear. Oh, how fun! 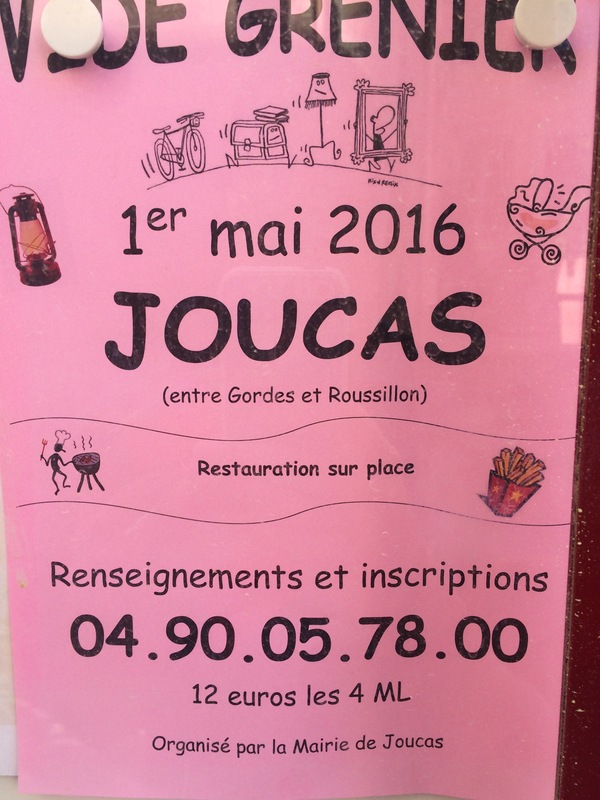 Joucas is my favorite village. Looks like a wonderful day! Love the chair as is, but I’m a fool for painted furniture! 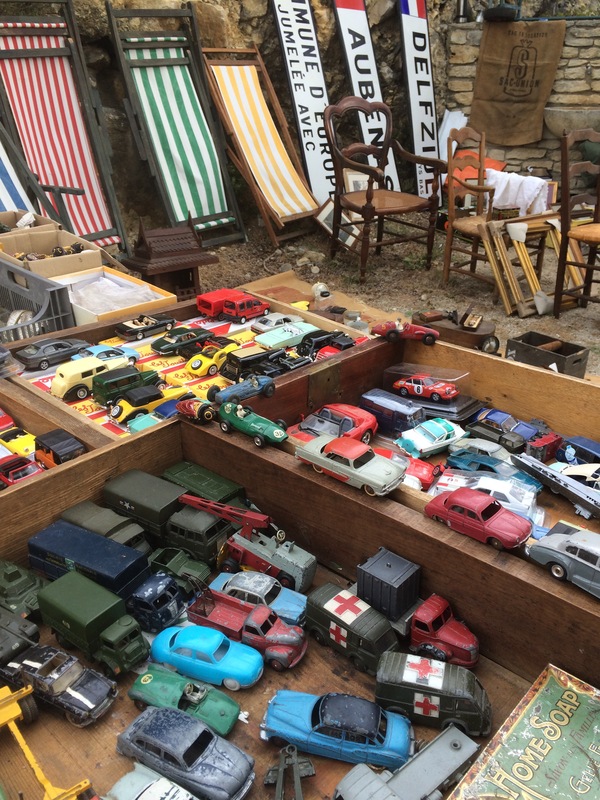 I ended up at a Vide Grenier in Trebes several years ago and just drove to the gate assuming people would have left…and I was right; I’m of the never take the first parking space school, sometimes it works and sometimes it doesn’t. Thanks, I’m a sucker for painted furniture too – unfortunately at Joucas people were still waiting for any spaces in the nearer parking areas when I left – serves me tight for being so early I suppose ( perhaps next time I’ll leave at the crack of dawn – I might be luckier that way) ! Another hint is to ask if the seller is going your way at the end of the day and can drop off your big item. This is how we got a chest back to our place after a far-away vide-grenier. It is worth a try as often it is more important for the seller to make a sale and not take everything all the way home.